Eckhaus Latta SS’17. Image courtesy of Vogue. 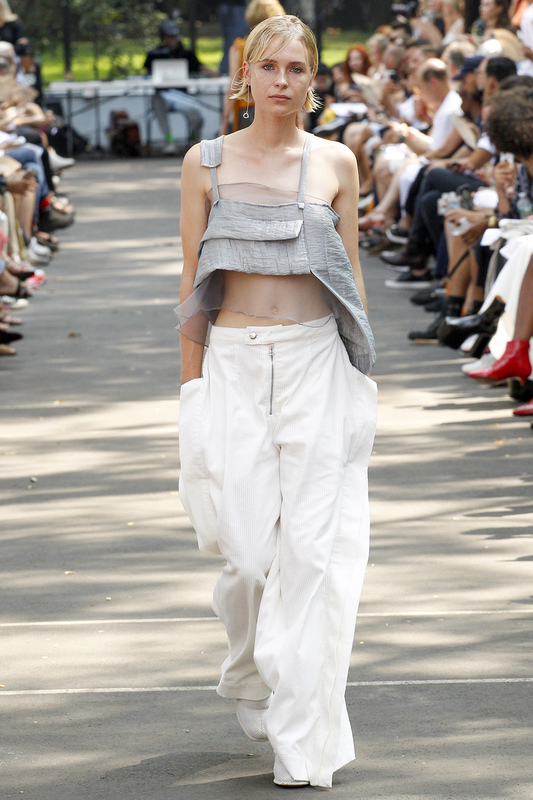 Last season Mike Eckhaus and Zoe Latta held their runway show in a spacey geodesic dome at MoMA PS1 but for their latest NYFW presentation on September 10th, the RISD grads brought things back down to Earth, opting to show their SS17 clothes in the middle of the Lower East Side’s Seward Park. The location choice spoke volumes about their evolving design sensibility. While past collections have functioned more as wearable art, Saturday’s offering showed a more grounded and realistic side of the duo, clothes presented were practical for city life. Deconstruction was still at the heart of every look – knits were slightly unraveled and dresses were made from a trash-bag like material. However, whatever was undone served as mere embellishment without sacrificing functionality. Eckhaus Latta should be commended for being one of the first design teams to present “real” bodies of all shapes, sizes, and ages on the runway. They continued the practice for their latest collection. In the place of model waifs and gazelles their friends walked in the show – lending an extra layer of uniqueness to clothes that already speak volumes.